Originally we were planning a holiday in the Lake District, but we couldn’t find a site with the facilities we wanted (mainly indoor pool) for the right price and with availability the week before the summer bank-holiday. 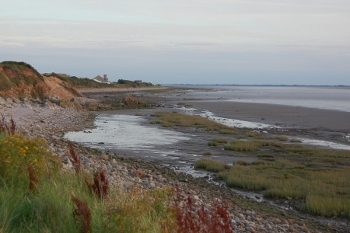 We therefore settled on the Ocean Edge caravan site near Morecambe. This is about an hours drive into the Lake District which allowed us some days out into the area, but was also close to the seaside resort of Morecambe so that we could have it as a family seaside holiday as well. The site was cheaper than many of the other sites we looked at. The site is run by SouthLakelands Holidays, but their website didn’t work with my browser (Firefox on Linux) so we booked the holiday through Hoseasons. 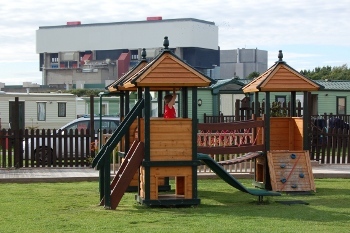 During booking we there was a bold notice that the site is right next to the Heysham Nuclear Power station. The power station is not a particularly attractive building (see right), and when at that end of the park you can hear a faint noise of the chiller systems, but it is not something that deterred me from booking.. 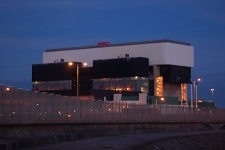 The site is accessed down a narrow road near to Heysham port and nuclear power station. It is at the seas edge, but there is a large rocky / muddy “beach” area and the sea goes out a long way. If looking for a beach to build sandcastles and paddle in the sea then Morecambe is only a short drive way. The site appears to be mainly occupied by privately owned caravans as many have their own gardens or ornaments around their caravans. The caravan was in good condition except that the light in the toilet did not work. Unfortunately it took 3 days for the light to be fixed and was only resolved after I’d asked to speak to the manager (although I didn’t actually speak to the manager as he/she was in a meeting at the time). This meant that we had to use a torch when using the toilet at night which was not particularly nice. Also although there was a DVD player the remote control did not work (I tried new batteries) which meant that it was unusable. We took our car DVD player with us so used that instead. There is a children’s playground and and a good free indoor soft play area. There is an indoor swimming pool. The pool was not very busy in the mornings (in most cases we had the pool to ourselves at about 10am). There was no baby changing in the male changing room which would have been useful, but other than that it was quite good. The site had entertainment in the evenings which started with a children’s disco including the entertainment staff leading the children through some action songs. Unfortunately there was no sign of Billy Beaver despite being promoted as a feature on the promotional video and photos for both South Lakeland Holidays and Hoseasons and in the booklet in the caravan. This was disappointing as it was one of the things that appealed to us when taking young children and they had got excited about meeting him. At first I thought this may have been due to having less staff during the week, but we were there for the Friday night of the busy public holiday weekend and there was still no sign of Billy Beaver. The children did enjoy the disco, but this was not as good as the children’s entertainment that we have been to at John Fowler’s caravan parks or Haven Holidays etc. The site is close to the seaside resort of Morecambe. Blackpool is within a reasonable distance for a day out. It is about an hours drive to the South Lake District which is okay, but as we spent several days in or near the Lake District and so may have been better off with a site a little closer. Whilst happy with the majority of the site I was very disappointed that they used Billy Beaver as a marketing feature, but then there was no indication of when we could take our children to meet him. Although it was certainly within driving distance of the Lakes for an occasional day we spent several days driving the same route up the M6 and so in future I think we’ll be looking for a site nearer to the Lake District. This entry was posted on Monday, September 20th, 2010 and is filed under Babies, Children, Family, General, Holiday. You can follow any responses to this entry through the RSS 2.0 feed. Both comments and pings are currently closed.